This is a 50-50 cotton/poly jersey t-shirt for men from Sanmar with a seamless body to suit according to your body fit. It's styled in a crew neck and short set-in sleeves. It features a taped shoulder to shoulder to make you more comfortable. It has a two-needle cover stitching on front neck. A single pocket on the left chest is added which is meant for storage of your handy personal belongings. Choose among 11 colors for your preference in a size range starting from S to 3XL. 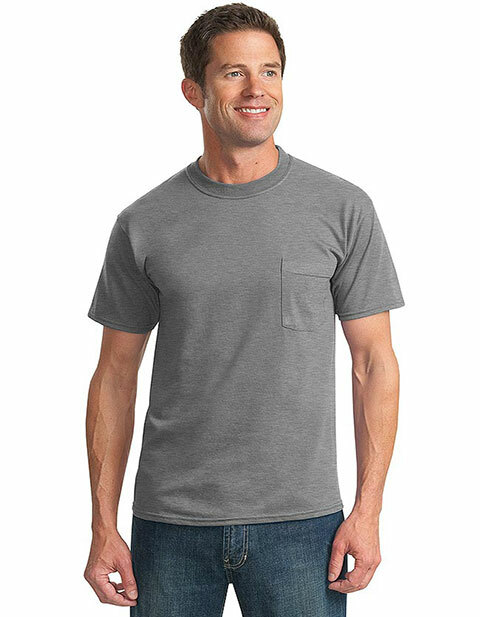 Like most Sanmar shirts, this promises comfort and durability.